Instead of storing data on my hard drive, I store a lot of data on memory sticks, which I had hoped would protect me from the computer becoming infected. Unfortunately, one of my sticks, that has some valuable data on it (mostly Excel, Wor and pdf files), doesn't seem to be working any more. When I put it into the USB port, my computer tells me that it needs formatting. Is there any way I can fix the stick or at least recover the files from it? We could do with having a look at Windows Disk Manager when the said thumb drive is inserted in the USB port, if not sure how to grab and upload a screenshot of Disk Manager let us know what version of Windows you are running, 7/8.1 or 10 etc. I think I managed to get a screen shot in Disk Manager (see png file attached). The stick is drive D - which is reported as healthy. The device has been changed to RAW from NTFS and that is why you cannot access the data, depending on how this has happened you may or may not be able to save your data and/or the device itself, if you check your screenshot you will notice that it says that the amount of free storage space on the device is 100% which technically means that there is nothing on the stick. Looking at the storage capacity it would appear that the thumb drive would be labelled as 16GB, how much free storage space out of this was available previous to this happening. It's hard to say exactly, but I only had Excel, Word and pdf files on there, which don't usually use a lot of space. I'd be surprised if there was 1GB of data on there. You're right by the way, it's a 16GB stick. PS I think the problem arose when my wife took the stick out of my desktop and tried to use it with her laptop (Windows 10 also). Could that have caused the change? As to what caused the issue, hard to say, sounds like there was plenty of free storage space on the drive which would rule that out, using the device between two recent Windows computers would not normally cause an issue ** but only as long as the device was properly ejected. ** You should never share storage devices with other peoples computers, being that this was your wife`s computer you should be fine but using thumb drives etc between other peoples computers is a common way that malware is spread, cracked software and pirate movies most often what is being shared. Tried Recuva, it couldn't find anything. I'm pretty sure the files haven't been erased though. 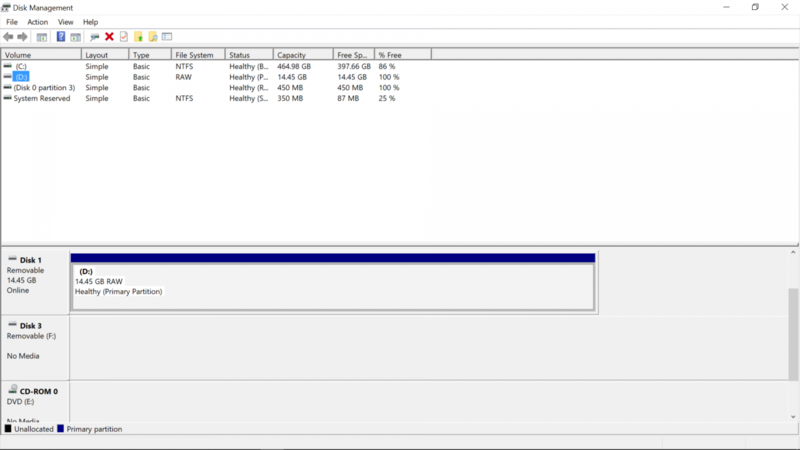 Is it not possible to switch back to NTFS? Converting the device from RAW comes with risk and that is why trying to recover any data on the device is done first and even if the device itself is still good it will need to be formatted before it can be used again. Yes, I ran the EASE free version, took over a day but found 29 files. When I clicked on recover it told me the free version was only for viewing purposes. If I want to recover the files, I have to buy a licence at £71.99. So am I faced now with the choice of payng or losing the data? Wasn't aware of such a cost to be honest, why do they advertise it as being free, I know that Mini Tool will only allow the recovery of 1GB of data for free using their software and that was why I did not suggest it, there are others around such as M3 data Recovery but having not used them I cannot vouch for them. Something that I will mention is that most recovery software tools do not guarantee a100% data recovery success rate so there is always a gamble even if you pay for a licence. Are you sure that I can recover data with Mini Tool? "This RAW to NTFS converter owns six editions, among them, the Professional Edition is highly worth recommending since "Partition Recovery" is a paid feature. Its Free Edition can only be used to scan lost partitions but not to recover partitions.". I reckon 1GB is more than enough for me. I'll have a go with M3 and see what happens.